264 participants who were considering cosmetic surgery but decided against it. 1000 people from the general public who said that they would never consider such procedures. Developed a higher esteem and in general found, not only the operated feature, but their body overall more attractive. Yet despite such a wealth of information available at our fingertips, cosmetic surgery myths and clichés still abound. While in popular media the cosmetic field is often associated with vanity and glamour, in reality, cosmetic surgeons are highly concerned with how surgical procedures can help improve their patients’ well-being and overall quality of life. At Peterson MD, a Kelowna based cosmetic surgery clinic, we are passionate about helping our clients feel more healthy and positive about their bodies. 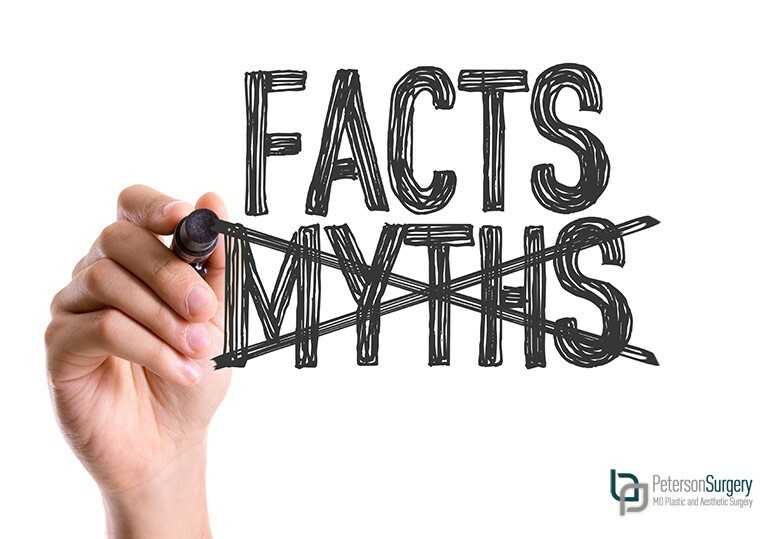 If you are considering a cosmetic surgery procedure, we want to make sure that you are able to make an informed decision, one based on facts, which is why today’s blog has been designed to debunk three of the most popular cosmetic surgery myths. Non-surgical cosmetic options such as Botox and facial peels. As the technology and methods involved in cosmetic procedures continue to evolve, such surgeries are no longer considered the bastion of the rich and famous but rather are a viable option for everyone. Cosmetic surgery can profoundly affect the way people think and relate to the world around them. A number of our patients have experienced an improved quality of life and a boost to their self confidence after their procedures. However, before undergoing such surgeries, it is important to have realistic expectations both of what your body is capable of accepting and how your surgeon can help you achieve all your aesthetic goals. While it is common for women between the ages of 50-70 to consider cosmetic surgery as an anti-aging technique, there is a definite influx of younger female patients (between the ages of 22-33) who are seeking plastic surgery procedures to help enhance and maintain their youthful appearance. Because everyone’s skin is different and ages uniquely, there is no ideal age to begin looking at cosmetic surgery options. Dr. Brian Peterson works with patients of varying ages to find customized solutions to all their aesthetic needs. For more information on how we can help transform your life and well-being through our extensive list of cosmetic surgery options, call our clinic at 250.868.9099 or visit petersonmd.com to book a consultation with Kelowna-based cosmetic surgeon, Dr. Brian Peterson.